Washing your dog is a necessary grooming task. However, using soap or shampoo on a dog's face or beard can be a problem. The soap can be ingested or burn your dog's eyes. Some dogs are also sensitive to the chemicals and fragrance in shampoos and soap, leading to irritation, hot spots or discomfort. 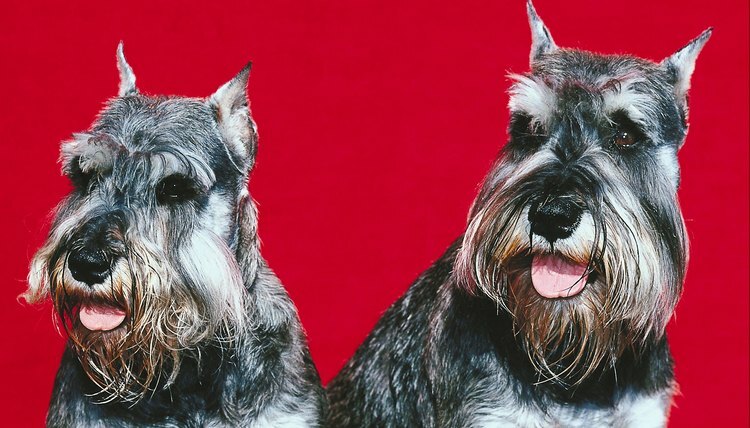 There are alternatives to cleaning your dog's beard or face that are more natural and effective. White vinegar has long been used as an effective and natural cleaning product and can be safely used on your dog. Soak up the vinegar on a sponge or wash cloth and rub onto your dog’s beard. Rinse with warm water. Another natural cleanser that can be an alternative to soap is baking soda. Simply make a paste of baking soda and warm water. Rub the paste into the dog’s beard, which should deodorize as well as eliminate dirt. Rinse thoroughly with warm water. You can also sprinkle dry baking soda onto your dog's coat and rub in to eliminate odors and dirt. Brush out your dog thoroughly. There are many naturally occurring soap alternatives including soapwort and shagbark that are safe for external use on dogs. These include saponin-containing plants that can be boiled down and strained, resulting in a homemade product that acts like soap for both humans and pets. You can get soapwort and shagbark at most natural food or health food stores as well as from online merchants.